As the world’s biggest sporting event, Fifa World Cup 2018, moves into its final stages, both India and India Inc. are settling into their football groove. Brands such as adidas and Sony Music have come up with World Cup-themed competitions and campaigns so that their employees can have a little fun while chasing business targets. Many, like Pune-based tax compliance firm Avalara, noticed tremendous interest among employees and decided to either screen key matches on big screens within the office, or take interested employees to conveniently located restaurants and bars that are showing the games live. Such moves by organizations are, in football parlance, perfectly weighted passes rather than speculative shots at goal. “Events like the World Cup and Indian Premier League are extremely beneficial to organizations. They can help drive values, behaviour and performance, and HR teams can find multiple avenues to engage talent while these tournaments are on," says Rajan Kalia, founder of Gurugram-based talent management and leadership consultancy Salto Dee Fe. At Sony Music, a large number of employees are passionate followers of football. “At every Fifa World Cup, we arrange match screenings for our employees from the round of 16 onwards," says Arjun Sankalia, head of international and special projects at Sony Music India. Depending on the popularity of the game and the number of people expected for each screening, Sony Music either sets up a projector within the office in Mumbai, arranging snacks and refreshments, or moves the party to the nearest spot that is showing the game on a big screen. Gurugram-based financial services start-up True Balance and the adidas Group have been screening key games and are gearing up for more in the knockout phase. Even co-working spaces like GoWork are arranging screenings at their facilities. 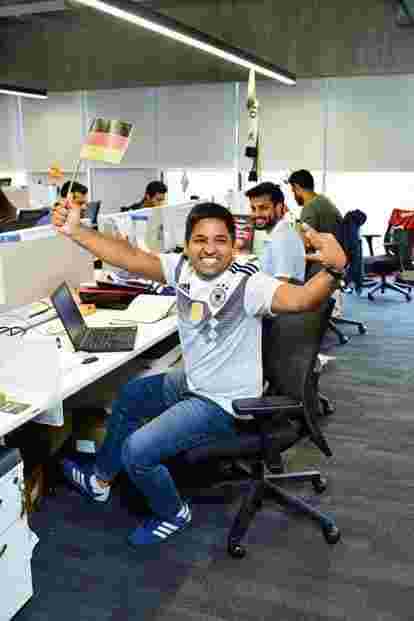 Sudeep Singh, co-founder and chief evangelist at GoWork in Gurugram, says: “To dive into the millennial spirit, we have organized a live screening for the Fifa quarter-finals at our co-working campus. The event is aimed at encouraging networking and will see a convention of VCs, start-ups, and angel investors come together and cheer for their favourite team as well as enjoy an eventful night." Nitasha Dusi, Avalara India’s senior manager and head of talent management, says: “We got the idea for the screening after seeing many of our team members animatedly and emotionally discussing the exit of Germany." Adidas, which has kitted out 12 teams at the ongoing tournament, is screening games at the cafeteria in its Gurugram office, and is planning a special screening of the final to which employees can bring along their families. Up to 30 people could be spotted at the adidas screening area for a 7.30pm kick-off even during the first round if the big teams were in action, says Aanchal Budhiraja, a customer life cycle management manager at the sports goods company. From previous experience, Budhiraja has found that sports can lead to better interaction between teams. “I played cricket against the team from the finance department during an in-house tournament and got to know many of them better. It improved the camaraderie and communication between us," she says. Kalia says smart organizations use such events to their advantage. “Corporate houses ride on these waves to integrate employee engagement and organization performance, resulting in a high-performance culture," he adds. “When there is a common string binding together people in an organization, such as football in this case, bringing them together informally helps improve rapport. This helps create a better organizational culture and translate informal partnerships into organization gains," Dusi adds. Some companies are going further, trying to liven up the mood with contests and games. Sony Music, for instance, has put up a prediction board in its office. “Most of the company participates in this game where they predict which teams will make it to the semis and finals. The winners get fun gifts, including beer," says Sankalia. Adidas has given its office a World Cup-themed decor and organized several contests for employees in, such as prediction contests and an employees-only fantasy league. They are also playing real football as part of the Arena Champions Cup, a seven-a-side football tournament comprising 12 cross-functional teams. The exciting prizes that are up for grabs—including the official Telstar ball—are motivation enough for employees to take part. Dave Thomas, adidas Group India managing director, says: “Sport has a great influence on our employees’ lives. Sport builds strength, confidence and lifelong friendships. Our World Cup initiatives create more hype and engagement and provide a platform for employees to compete with each other." Sankalia says such initiatives not only bring people together, they serve as “a great outlet for people to show their true passions". Shrenik Avlani is co-author of The Shivfit Way, a book on functional fitness.